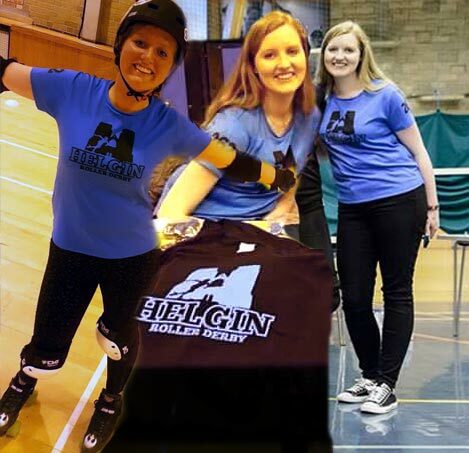 It’s a rather exciting month in Scottish roller derby – the World Cup has just passed, Camp Elite UK is later this week, and Miracle Whips is making her way to Orkney the week after that! It’s also the month that our baby skater, #262 Dead or Red turns 18, and officially becomes old enough to play games! We’re hoping to get a Helgin game organised so she can play in our colours before she swans off to Uni and leaves us, after her birthday bumps, of course! What better way to start the month of her birthday, than featuring in our Skater Spotlight! A waitress in the summer, but currently a retail assistant. I do illustration and art as much as possible! I also do some hiking and camping through explorer scouts. Canada! I love the landscapes. Drawing! I’m currently trying to get into art school so I can put it to good use. The movie Whip It. I’ve seen it so many times, and I was so delighted to find a local team. Don’t hold back! And trust your skates! Falling never hurts as much as you’d think. Scald Eagle of Denver Roller Derby, because she’s tall just like me, and absolutely rocks it! Passing my laps after a year and a half. It had become the bane of my existence, and I was so excited to finally get it done!